The Children’s Aid Society of Haldimand and Norfolk (CASHN) is preparing for the second annual Radiothon and is seeking support from local businesses, organizations and the public. The “Little Dreams, Big Dreams Radiothon” was created to raise money for the Fresh Air Fund which helps children from our communities attend camp and participate in recreational activities. The Society is also fundraising to help community youth and youth transitioning from the Society’s care by providing bursaries to support post-secondary education at college, university or trade schools. The Society will provide a $1,000 bursary to a student from Haldimand County and a $1,000 bursary to a student from Norfolk County who plan to pursue post secondary education in social work or a related field. Such programs may include a Bachelor of Social Work Degree, Child and Youth Worker Diploma, or Social Service Worker Diploma. 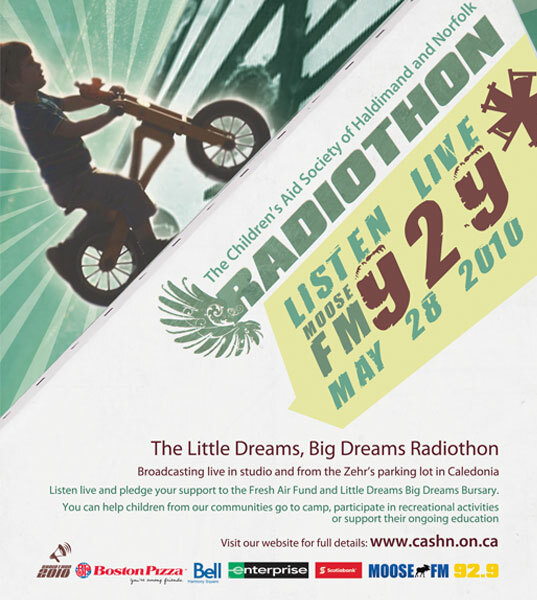 The Little Dreams, Big Dreams Radiothon will be hosted by Moose FM 92.9 and transmitted live in studio and from the Caledonia Zehr’s parking lot on May 28, 2010 for a 12 hour period. The event begins during Moose FM’s morning show hosted by John Hardy at 6 a.m. Throughout the day, audiences will hear live and pre-recorded interviews with youth, staff and foster parents. The Radiothon will also feature information about The Children’s Aid Society’s programs and services and the community Fresh Air Fund. The Society is hoping to augment this event with fundraising challenges where school classrooms and businesses can compete to win various prizes. Last year several classrooms won pizza parties courtesy of Boston Pizza. We also awarded a grand prize to business which included a promotional package worth more than $3,000.00 in radio spots, print advertising and media support. Similar prizes will be offered to businesses and organizations in 2010. Scotiabank in Caledonia has made a commitment to match up to $5,000.00 in donations again this year. In 2009, the Radiothon raised $12,737.58. This year’s target is $20,000.00, which we hope to obtain through the renewal of last year’s sponsors and the acquisition of new sponsors this year. All money raised goes directly to children and youth. You can also help the Society by requesting a donation collection box for your business or office. Donations will be collected prior to May 28, 2010, or you may wish to make your donation on the air during the Radiothon. Businesses can also support the Radiothon by donating prizes to be given to radio listeners on the day of the event. If you are interested in becoming a radio sponsor, Moose FM 92.9 in Caledonia is offering special radio packages and is seeking twelve primary sponsors for each hour of the Radiothon. Each sponsor will receive four radio ads and a live interview in their allotted time. The cost for each hour is $500.00. Due to overwhelming interest from businesses last year, Moose FM 92.9 will be offering secondary sponsor advertising spots that will consist of four radio ads, but will not include an on air interview at a lower cost. One hundred percent of sponsor revenue will be donated by Moose FM 92.9 to The Children’s Aid Society of Haldimand and Norfolk during the Radiothon. For further information regarding radio sponsorship, please contact Nancy Brown Dacko, Vice President and General Manager of Moose FM 92.9 at (298) 284-1070 (ext. 1040). The Society is also offering select businesses the opportunity to set up their promotional tents in the Zehr’s parking lot free of charge. In return, we ask that businesses help us fund raise during the day through collection boxes, or by donating a percentage of sales proceeds to the Radiothon fundraiser. You can belong to a community that nurtures the lives and dreams of children.